Christian leaders in the Holy Land reopened the Church of the Holy Sepulcher Feb. 28 after the Israeli government set up a negotiating team to resolve a municipal dispute over property taxes. The heads of Christian churches expressed “our gratitude to all those who have worked tirelessly to uphold the Christian presence in Jerusalem and to defend the Status Quo,” the 19th-century agreement that governs Jerusalem’s holy places. He told Catholic News Service that the church’s 10 Franciscan friars continued celebrated Masses for the intensions of the pilgrims who were unable to pray in the church, where tradition holds that Jesus was buried. 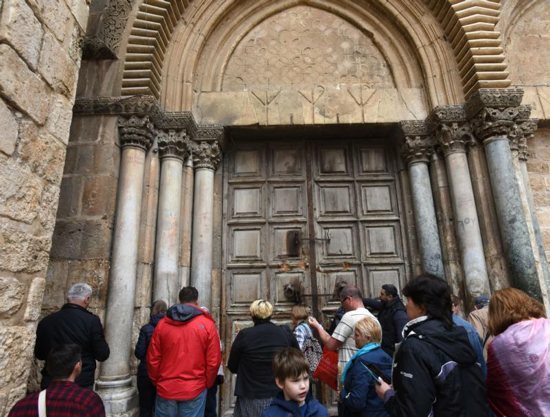 Although the Church of the Holy Sepulcher was not being taxed, in early February the Jerusalem Municipality announced it would begin collecting $186.4 million in property taxes from some 887 church-owned properties that were not houses of prayer. He said that while the bank accounts of the Franciscans had not been affected, some of the accounts of other churches, such as the Anglicans and the Assyrians, were frozen in mid-February. The Franciscans did receive a bill for a property they owned, he said, but he declined to disclose which property and the amount. He said some churches has been threatened with confiscation of property if the bills went unpaid, and churches were being charged retroactively for seven years. Father Grenier noted that the actions had also affected U.N. property in the city. The Israeli government said the team negotiating the current tax crisis would consist of representatives of the finance, foreign affairs and interior ministries as well as from the Jerusalem Municipality. According to a statement from the prime minister’s office, the Jerusalem Municipality will suspend the collection actions it has taken in recent weeks. The committee is also slated to look at the issue of Jerusalem land sales by the Greek Orthodox Church. Church leaders feared a bill in the Israeli parliament would allow for state expropriation of church land. Media reported that work on the bill was suspended until the committee could present its findings. “For us, the important thing is that the measures taken against the churches have been suspended,” Father Grenier said. He said the measures could have been potentially more damaging for the smaller churches, such as the Ethiopian and Syriac churches, and some Catholic religious congregations would have had to close some of their institutions if the measures had been carried out. “We are not a business. If we had to pay the bills, of course, we could not keep all our activities. Our schools don’t make a profit, and if you add having to pay the taxes, we would not be able to maintain them,” he said. Earlier in February, some political commentators suggested that the threat to impose taxes on church property was a ploy by Jerusalem Mayor Nir Barkat to try to get more funding for his city from the Ministry of Finance. Prior to this crisis, he had urged municipal workers to go on strike, leaving the city buried in garbage in an attempt to get more funds. The church leaders’ closing of the Church of the Holy Sepulcher during Lent, close to Easter, the busiest time for pilgrims, drew international attention and condemnation. However, in a Feb. 28 statement, David Nekrutman, executive director of The Center for Jewish-Christian Understanding and Cooperation, chastised the church leaders for having likened the recent legislative bill to those enacted by Nazi Germany against the Jews. “These remarks are extremely offensive and an apology from them is warranted,” he said. He also condemned what he said were the false accusations of a systematic campaign of abuse against churches and Christians. “Israel is the only country in the Middle East where Christians and believers of all faiths have full freedom of religion and worship,” he said.